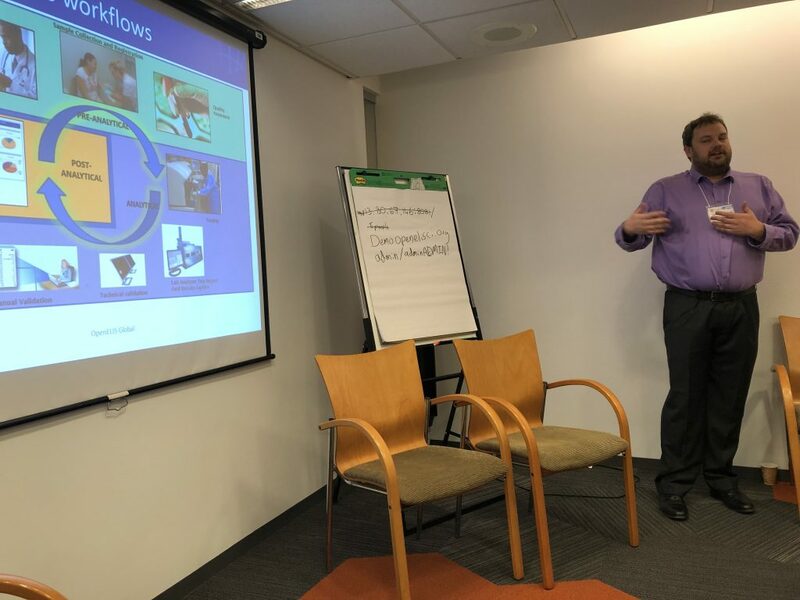 Casey-Iiams Hauser, Senior Informatics Implementation Specialist, presents on laboratory information systems at the Global Digital Health Forum in Washington, D.C. The Fifth Annual Global Digital Health Forum was held from 10-11 December in Washington, D.C., attracting more than 300 participants to the FHI 360 Conference Center. At the forum, representatives from the new Digital Initiatives Group at I-TECH (DIGI) and its partner in Haiti, CHARESS, shared knowledge and lessons learned from 15 years of experience implementing digital health solutions worldwide. The theme for this year’s forum was “A Shared Language for Digital Health,” and built on a foundation of the World Health Organization’s Classification of Digital Health Interventions. Diallo moderated a panel titled “Different Labs Need Different Systems: An Exploration of Open Source Laboratory Information Systems Use in Global Health and the Community of Practice that Brings Them Together.” Jan Flowers, DIGI Faculty Co-Lead and Director of Global Health Informatics at the University of Washington Clinical Informatics Research Group, and Casey Iiams-Hauser, Senior Informatics Implementation Specialist with DIGI, were panelists, along with Steven Wanyee of IntelliSOFT, a former member of the I-TECH Kenya team. The panel highlighted LIS as a critical component of national health information systems (HIS) architecture, exploring a complementary suite of open source LIS that are implemented across low- and middle-income countries, describing the laboratories and use cases each serves. CHARESS HIS Lead Nathaelf Hyppolite participated in a session highlighting the development, implementation, and transition of EMR in developing countries, drawing on I-TECH and CHARESS’s work in Haiti. Participants heard about the benefits of an interoperable EMR: a unified data format, the ability to back up data, and that same data can be used to generate reports via DHIS2 from both the cloud servers and hardware EMR system. Hyppolite also shared the advantages and limitations of transitioning to an OpenMRS and OpenHIE platform, which bring experts together to share knowledge, standards, and best practices, as well as collaborate on technologies. This focus on community and communication was noted by Diallo and the other participants. “DIGI really appreciated the opportunity to learn more about new standards and technologies, how to best approach digital health governance work, and how a shared language will help us collaborate and work together to ultimately improve health outcomes,” said Diallo.